Learn how to set up a test with AutoPilot. With AutoPilot, Morae presents study and task instructions, along with surveys, right on the computer running Recorder. By default, AutoPilot logs the start and end of tasks automatically, while Observers can still connect and log markers. You do not have someone to log tasks with Observer. You want to conduct unmoderated sessions. You want to log tasks automatically. You want to present surveys automatically. You want to avoid the need to print task and survey paperwork. 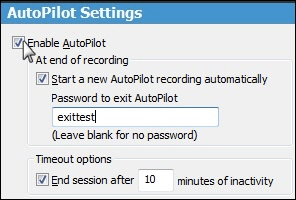 To set up Recorder to use AutoPilot, you can either Use the Unmoderated Usability Study Template or Add AutoPilot to a Study Configuration. Open Recorder. The Welcome to Morae Recorder dialog box opens. Select Create a new study configuration based on. Select the Unmoderated Usability Study template from the dropdown list. Click OK. The template study configuration opens in Recorder. 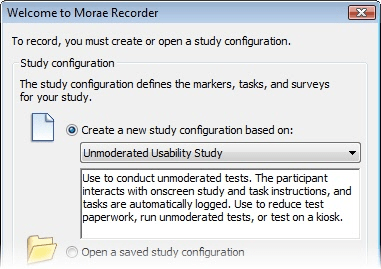 Click Modify Study Details to open the Study Details dialog box. Description tab: Fill in the Study Instructions field with directions for the participant. This could include an introduction to the test along with scenario information. 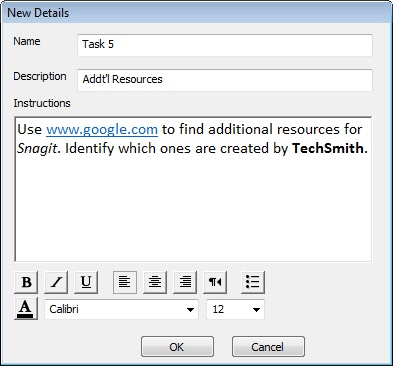 Task Definitions tab: Fill in the Task instructions for participant field for all tasks. Include the task and any information a participant needs to complete the task, such as a user name and password. Survey Definitions tab: Create and associate surveys with session events, such as the end of Task. Only associated surveys automatically display with AutoPilot. 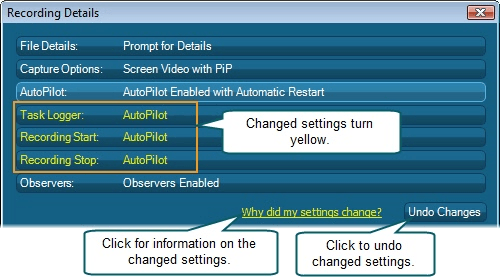 The Recording Details are set up to run sessions with AutoPilot, record the screen and PiP, automatically restart after a recording ends, defer recording processing, and allow Observers. If you need the change these settings, click Modify Recording Details. Save the study configuration file with File > Save Study Configuration or click the Save Configuration icon. Open a study configuration in Recorder. Click Modify Recording Details to open the Recording Details dialog box. In the Recording Details dialog box, click AutoPilot. When you enable AutoPilot, all other settings needed to run an AutoPilot session automatically change to provide the recommended configuration. Modify any other recording details and click OK.